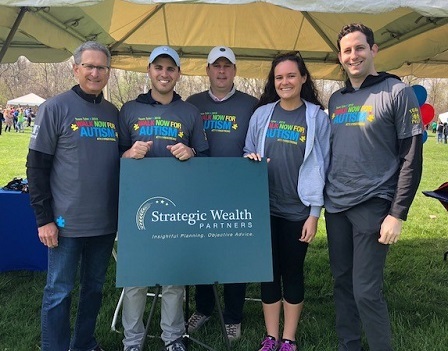 On Sunday, May 6th, members of the Strategic Wealth Partners (SWP) team attended the Autism Speaks – North Shore Walk at New Trier High School. SWP is proud to support the mission of Autism Speaks and serve as corporate sponsor of Team Tyler. Watch this clip from the TODAY show to learn more about Team Tyler. Autism affects an estimated 3 million people in the United States and 70 million people worldwide. More than 90 percent of the world’s autism community lives in low- and middle-income countries with little access to autism services or support, challenged by the high cost of care, as well as stigma and social intolerance. Read more about the impact of Autism Speaks.